"These tiny quinoa seeds really are sponges for flavor. I was really surprised how decadent and satisfying this seemed, and with only a tablespoon of vegetable oil and a handful of very lean smoked ham." 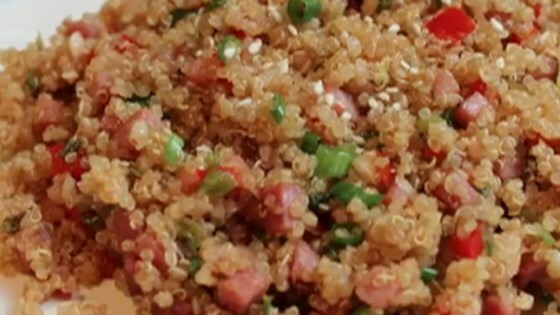 Watch Chef John put a modern, healthy twist on pork-fried rice. Awesome recipe! First time DH tried quinoa and he said it was better than rice. Used green and red bell pepper in the dish. Wow! So surprisingly satisfied with how good this turned out. I really do think I like it more than fried rice! Ready to try it with other ingredients mixed in! Added more veggies (red cabbage, peas, white onion, grated carrots) so doubled the sauce. Doubled the garlic and used about 2/3 of the cooked quinoa. Did the poached egg on top. Really good.